Old Solomon Island Artifacts are valuable and very collectible especially pieces made for indigenous use and not for sale to tourists. The best-known piece of Pacific Islands art from the Solomon Island is the Nguzunguzu canoe prow. The Solomon Islands do not only have the one art style and the traditional Tribal Arts varies from island to island. Artistic variation reflects traditional cultures more than political boundaries. 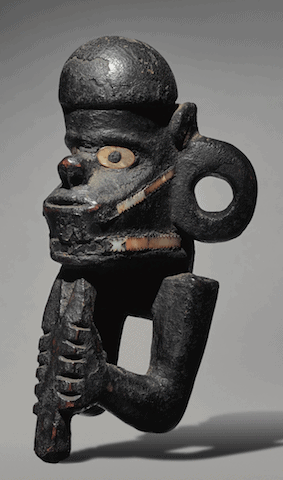 This article looks at the different styles of Solomon Island Artifacts. It will give you an idea of what to look for when determining if your piece of Solomon island Artifacts is a masterpiece or not. I buy and sell Solomon Island Artifacts and art from the Pacific Islands and the process is very easy. Just send me a photo of your Solomon Island Artifact and I will give you an idea of what I would be willing to buy it for. 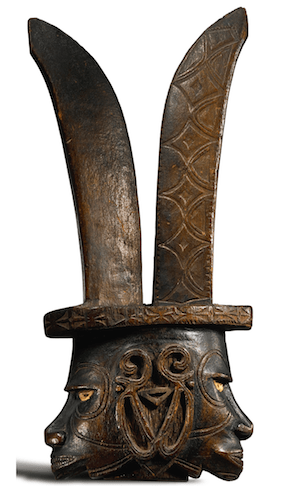 In general, many Solomon Islands Artifacts pieces can be easily distinguished from other Pacific islands Arts. Solomon island art often uses inlaid shells and has a high degree of refinement. It is impossible to cover the subject of Solomon island Artifacts in great depth in a single article. This is just a taste of some of the wonderful objects that this region of the Pacific produced. The Solomon Islands lie to the South East of New Guinea in the Pacific Ocean. Culturally Nissan Island, Buka, and Bougainville are a part of the Solomon Island Art. They are artistically more a part of Solomon Island Art than New Guinea Art. The two most renowned areas of Artifact production in the Solomon Islands are Roviana and Marovo. The Solomon islands have 67 language groups and each group was a tribe. Different tribes made different art objects. Not only does Solomon island art vary between language groups it also varies over time. Art changes with westernization through colonization and missionary actions. The Solomon Islands used to be an area with both headhunting and cannibalism between waring island nations. Solomon islands Art reflects this with much of their art associated with canoes and warfare. Canoe prow figures are one of the most collectible art forms from the Solomon islands. They were mainly produced in New Georgia, Choiseul, Vella La Vella and Santa Isabel. Most canoe prows are from arms up and attached to war canoes for protective purposes. Newer copies are easily spotted because they lack the holes needed to attach them to a canoe. Not all Canoe prow figures have inlaid shell but the most desirable ones do. One of the most collectable paddles in all Pacific islands art also comes from the Solomon islands. Made on Buka Island and decorated with one or more figure in the squatting position with large “hats” on their heads. Skull huts made in New Georgia, Choisel, Vella La Vella and Santa Isabel. They often sit on the top of posts to preserve the skulls of important chiefs. These skull huts contained shell valuables called Barava and Rago. Skull shrines are almost always genuine. The shell valuables are still made today and are difficult to tell from old examples. Unfortunately, this makes all examples Barava and Rago less collectible. Barava are made from carved giant clam. They are wonderful art objects but are still being made today. Because they are not all old they are not as collectable and may come with unwanted CITES problems . Masks from the Solomon Islands made from natural fiber over a cane framework. They predominantly come from the Northernmost islands. Masks from these areas are rare and as a result very collectible. Their construction is very like several types of mask from New Guinea. 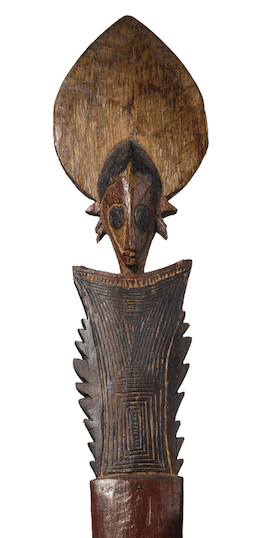 Solomon Island sculpture is rare and very collectable. Some sculptures are old house posts while others free standing deities. For more example of Sculpture I have bigger images at the end. Solomon island also made shields. The most collectible of these shields have inlaid nautilus shell. Solomon island shields tend to be a slightly tear shaped oval and constructed of woven fiber. Rarer forms of shield are a similar shape and made of wood and a rectangular shield from Santa Isabel constructed from bark and rattan. Shield types in the Solomon are far fewer than Shields from New Guinea. The south-east Solomon Island produced huge feast bowls used during a boys initiation into manhood. They come in a variety of styles but are usually inlaid in shells and have fish, or seabird motifs. The very best ones are shaped like birds or animals. There are later examples made up until the 1950′s and the age of the bowl is very important as later bowls are not very valuable. Many small sculptures are parts of utilitarian betelnut related objects. Gourd stoppers from Santa Cruz or limesticks and Betelnut mortars are all very collectible. Thes items are small but often superbly made. 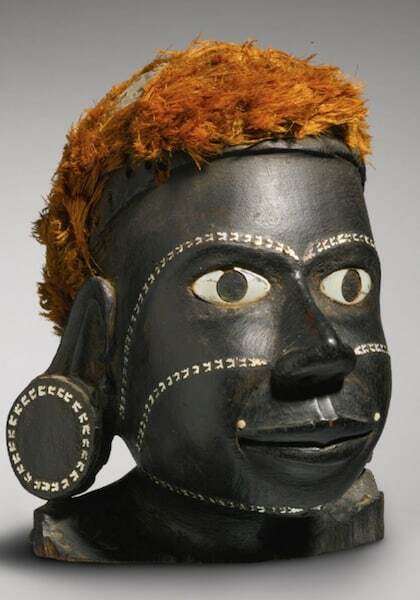 The Solomon Islands had a lot of different varieties of personal Adornments. These are covered in a seperate article called Pacific Adornments. Due to the superb craftsmanship of the Solomon Islanders some of the early pieces made for trade with westerners is also collectable. Early Tourist pieces are easily distinguished by their attention to detail and overall high quality. This article is only a sampling of the art from the Solomon Islands. There are several books on the subject and thousands of objects.